Ticket number is a commercial numbering system. It is the manufacturer’s reference numbers for the size of a given sewing thread. 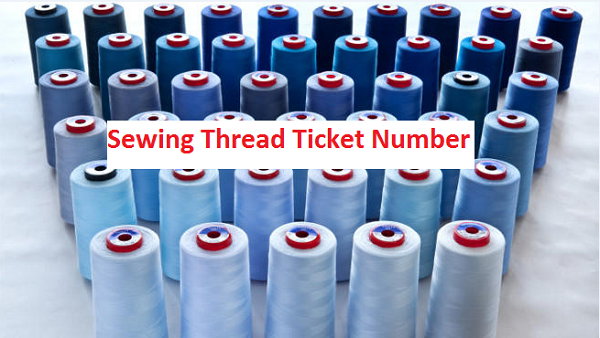 Actually, the size or count of thread is called ticket number. It is denoted by tckt, Nm, Ne etc. Metric, cotton is the ticket numbering system followed in readymade garments sector. Metric count or number is the system of ticket numbering. It is denoted by Nm. This is the number of meters of thread per gram. For example, one gram of single ply thread is 60m long. So that count or number of that thread is Nm 60/1. If the thread is double plied then metric ticket number would be Nm 60/2 and also the weight is 2gm for 60m long thread. Double plied means two number of single yarn twisted together ply yarn. in the same way, metric ticket number (Nm) 90/3 means 3 single yarns are twisted together to form a thread, where each 90m length of single thread is 1gram and the weight of 90m length of 3 plied threads is 3 gram. For easy understanding, the following table shows some example of metric ticket number. Cotton ticket number is used for cotton sewing thread. It is denoted by Ne. For example, Ne 60/3 means sewing thread is 3 plied and the weight of each ply of 60 hank in 840yds is 1 pound. To understand easily, the following table shows the example of cotton ticket number. Category: Garments Production Tags: sewing thread ticket number, ticket numbering of sewing thread, what is cotton ticket number?, what is metric ticket number?, what is ticket number? Your blog is enriched by so many important articles. Luckily, I found it while searching another topic in google. I will frequently visit your blog. Apparel supply chain management related issues are little bit complicated, but you brief it lucidly. Please carry on your writing. Thanks for your most valuable comment. Stay with us for more.